During the previous school year, several worlds collided. He wanted to have an empathy group to try to get children in school to think about others and how they might feel if they had no friends or felt different. Counselor Erin Murphy helped with the group, which started, Engstrom said, with about 30 interested students, and whittled down to about half that over the course of time, with the students who were really committed to its success sticking with it. Murphy said the group talked a lot about “kindness in action” and what they could do to help show that at the school. Of the ideas that were proposed, they took a vote and having two buddy benches on the playground was the winning idea. Dedication of the Buddy Bench and Gazebo on the first day of school, 2018. Family & Friends of Helen Rehor along with Andrew Barloon. 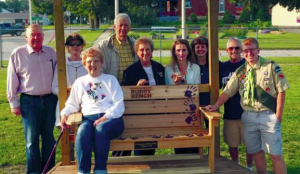 One of those buddy benches was named in honor of Helen Rehor, former Central Elementary Teacher of nearly 33 years. 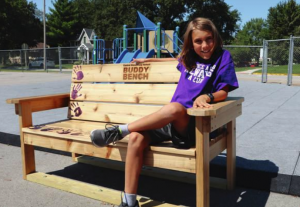 “We were reaching out to them, and in turn, they reached out to us and said they were buying two buddy benches and wanted to have one in honor of our mom,” said Nancy Rehor, Helen’s daughter and a 1977 graduate of Nevada High School. The family was very honored. “The funny thing is, I think she would have really loved that (a memorial for her) was on the playground, because she did lots of recess duty and spent a lot of time with all the kids there (on the playground),” said Nancy, who now lives in Palm Harbor, Fla.
Construction of the Buddy Benches, along with a Gazebo was led by Nevada High School senior Andrew Barloon. “A requirement for the rank of Eagle is to plan, fundraise and carry out a service project that benefits the community or an organization within the community,” he said. Last March, he started work to build a gazebo on the elementary playground that would provide shade to one of the school’s new buddy benches. It turns out that gazebo covers the bench that honors Helen Rehor. The construction phase of the project started in late June and was finished by mid-July. Miles, the student founder of Central’s Empathy Group, sitting on one of the buddy benches that were ideas of that group. “While I was at Central, there was a gazebo on the playground that served as a meeting place during recess, and I wanted to re-create that space after it was torn down,” he said. On the first day of school this year, Barloon was present for the dedication of the gazebo and buddy benches. “I was able to give a short speech about being an Eagle Scout and what that means, as well as talk a little bit about what Scouts is all about,” he said. He enjoyed the moment, he said, because he was able to see the appreciation for the project from the kids and school staff, as well as from the family members who were gathered to remember Mrs. Rehor.